Internationally renowned soil scientist and cropping advisor in the USA Neal Kinsey, says that that a sand will hold maybe 1 inch of water in the topsoil "to the depth a post will". He says a clay soil will hold maybe 3 inches. The research carried out in the U.K. by the author shows that we now have the ability to hold 5 to 10 inches. BILL BUTTERWORTH, a geo-recycling specialist, reports on research that points to the potentially huge and far-reaching agronomic and environmental benefits. One way of using organic waste in the UK - most of which is currently put to landfill - is to recycle it to topsoils, where - as research shows - it can hold 2 to 10 times its own weight in rainfall. Some believe that - in effect - this practice would create a 100-billion gallon "reservoir" - but at no capital cost and whose environmental impacts even the most extreme lobby would find difficult to reject. 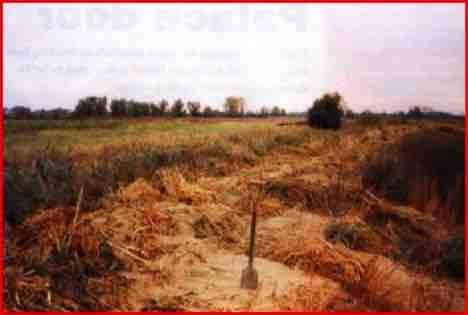 this, which is a fertile soil growing a good crop of fodder beet without irrigation. The difference was that contractor Aiwyn Moss of Mildenhall applied 250 tonnes per hectare of partially composted, shredded newsprint including some raw biosolids sludge (4%). It was applied in the autumn before the crop was planted so as to act as a topsoil reservoir. Note the concentrated compost layer about 150mm below the surface. Field research through out the UK - but most dramatically on the blowing sands of East Anglia - shows that adding 250 tonnes per hectare of partly decomposed organic material (avoiding the word "compost") can raise the water-holding capacity of the land. In this way, about 1000 to 2500 tonnes of rainwater per hectare can be held for crop growth the following season. At the 2000-tonne holding level, even in East Anglia, most crops can be grown without further irrigation. Even for top yields and in poor rainfall/high sunshine years the need for irrigation is dramatically reduced. Add the material in September, plough in and grow a root crop next year without irrigation. Generally speaking, according to the research, partly composted materials absorb 2 to 10 times their own weight in water. Shredded newsprint, for example, will absorb 5 to 10 times its own weight. When applied to soils, there are agronomic plusses and minuses, which can be managed. Top soil reservoirs are likely to have the greatest effect on crops on soils, which are 100%, i.e. without a grass break. In the east of the UK, these soils are often at below 2% "organic matter" and sometimes less than 0.5%. There does appear to be some significance in defining what way be meant by "organic matter". Soil scientists generally mean a complex organic mixture which is derived from plant and animal remains but which does not allow identification of individual parts of plants or animal parts under the microscope i.e. it is a homogeneous dirty black paste. Looking at water-holding capacity, undecomposed material is important, and the soil now becomes a dynamic processing factory, little short of a horizontal compost heap - much as occurs naturally on a forest floor. To put it another way, the soil is turned into a blotting paper framework to house enormous numbers of small fauna and flora. In this discussion, the most significant of these small fauna are mycorrhiza, the small fungi which surround plant roots. These vasicular arbuscular mycorrhiza (or VAM fungi) are deeply involved in water and nutrient uptake by the plant and in plant disease control. These mycorrhiza have another twist which completes a remarkable loop in the story (see below). Incidentally, in a recent advance discovered by Sarah Wright at the famous agricultural research centre of the USDA at Beisville, the protein that binds soil particles together to form "crumbs" was identified and named "glomalin". It is made by the mycorrhiza from organic matter. There are, of course, many estimates of how much waste is collected in the UK annually and in different categories. Some of the figures have some substance in researched reality; some have become accepted simply because somebody made a guess many years ago, and the figure has been quoted so often that we all believe it. Looking at those figures, and observing that high volume/low value materials are economically difficult to recycle in the conventional sense, it appears that maybe 100 million tonnes of wastes could be recycled to top-soil. These wastes would be "not-bio-unfriendly" (NBU) containing not only organic-origin materials, but also dust, ash, small-particle and non-toxic synthetics, decomposable synthetics, etc. If that 100 million tonnes of NBUs can be separated (which it can) and applied to farm and forestry land within a controlled dispersion policy, probably via deep clamp processing, then it will probably absorb and hold for crop growth around 500 million tonnes of rainfall. That is, a 500-billion litre (or 100-billion gallon) reservoir, exactly where - but exactly where - we need it. What's more, it took no energy expenditure to get it there. As a further part on the energy balance, the nutrient values of recycling these NBU materials will generally be around £8 to £10 per composted tonne (which will be about 60 to 70% of the fresh tonnage put into the process). That is about the tractor-and-man cost to turn and spread the material. Farming would also be saved maybe £600,000 expenditure on mineral fertiliser, mainly imported and subject to much discussion from the environmentalists. Certain field research has shown up a remarkable twist. When composting materials that are largely carbonaceous, adding a nitrogen source is possibly vital, but will, normally, at least, accelerate the process. On farms, it is logical to use livestock slurries, where available. This may have a plus in helping to reduce pollution incidents from animal manure slurries. An alternative is to use sewage sludge, or more likely in future, bio-solids cake. Now, as it happens, the Georgians (on the Black Sea) with some help from the USA, have identified and isolated a whole new range of antibiotics. They are derived from micro-phages. These micro-phages (wait for it) were isolated from sewage. Now this should not be a surprise; where there are bad bugs, there are always good bugs chasing them. And this could explain why some observant sludge managers have reported that there is less crop disease where there are regular dressings of bio-solids used as organic fertiliser. Now the jigsaw begins to hang together to display a new vision. Recycling municipal waste and bio-solids sludges to land with decentralised processing will have enormous environmental and financial advantages in fitting right into Agenda 21 (jobs in the countryside) and political recycling targets.